The Gemini features an easy to build on 2 post velocity deck design. 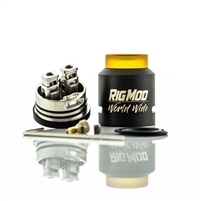 This RDA offers dual tiered, focus directed airflow straight to the coil with a continuously variable triple tiered air flow control ring. The delrin insert in the top cap is now threaded for added convenience, allowing the user to replace and remove the insert for replacement or chuff upgrades. The extended 510 connection keeps this RDA safe and the unique heat sink built into the top cap also echoes the brick mason theme.